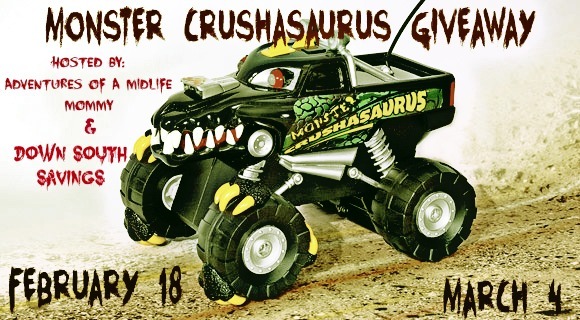 Welcome to the Road Rippers Monster Crushasaurus Giveaway Event hosted by Adventures of a Midlife Mommy and Down South Savings. Thanks to our very generous sponsor, Toy State, one lucky winner will receive a Road Rippers Monster Crushasaurus of their very own. This toy looks awesome ! Anthony would love it that's for sure !! Read the full review, including video clips of the truck in action by visiting HERE. The Monster Crushasaurus is available at most leading toy retailers, including Wal-Mart, Target, Toys r Us, K Mart and on Amazon.com and with a MSRP of only 21.99, it would make a great birthday gift for that special little boy in your life.... Or you can try your luck below. *Open to LOWER 48 STATES ONLY. Disclaimer: I was not financially compensated for this post. Sparkle Me Pink is not responsible for prize shipment.